OPS ARTICLE 20 & REDEPLOYMENT. What is the purpose of this exercise? The purpose of this PowerPoint is to provide you with a quick reference that will. 2 What is the purpose of this exercise? 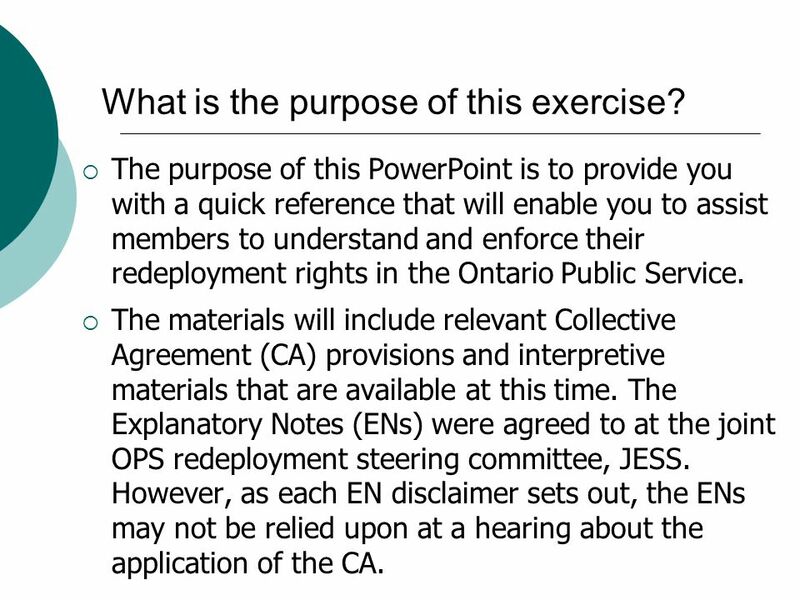 The purpose of this PowerPoint is to provide you with a quick reference that will enable you to assist members to understand and enforce their redeployment rights in the Ontario Public Service. The materials will include relevant Collective Agreement (CA) provisions and interpretive materials that are available at this time. The Explanatory Notes (ENs) were agreed to at the joint OPS redeployment steering committee, JESS. However, as each EN disclaimer sets out, the ENs may not be relied upon at a hearing about the application of the CA. 3 Purpose of this exercise contd The parties continue to work towards creating more ENs. In the interim the workshop materials include the employer prepared Interpretive Bulletins (IBs) for Recruitment and Conversion. 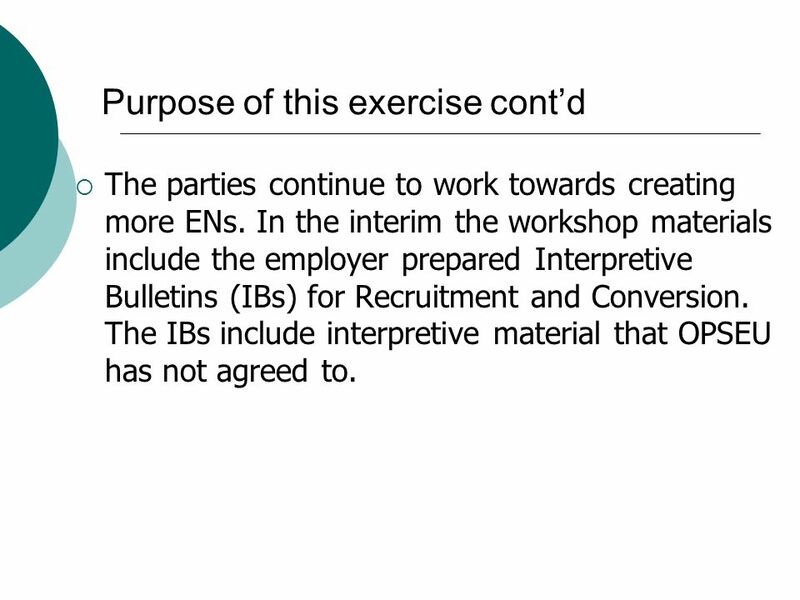 The IBs include interpretive material that OPSEU has not agreed to. 5 Member Employment Stability Tips 1. Complete & have an Employee Portfolio (EP) and attachments available and ready. The EP can be revised and updated at any time once submitted. 2. Know your Stewards, Local President and Staff Representative, they will be able to assist in finding potential regular or temporary assignments. 3. 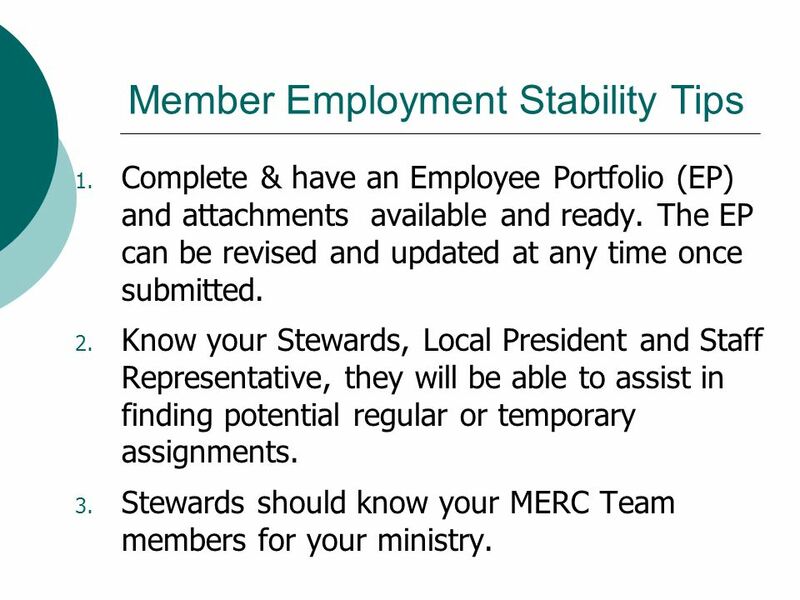 Stewards should know your MERC Team members for your ministry. 6 Employment Stability Tips 4. Pre-Notice Period - Article 20.1 - Employer (ER) will provide a 10 working day pre-notice in advance of providing official written notice of lay-off in order to allow members to elect one of three options. Members must return the provided form to let the ER know if they wish to take PIL (pay in lieu), Redeploy or Retire (possibly with a Pension Bridge option). If a member does not respond during this period, (s)he will be deemed to have opted for redeployment. Surplussing does not negate an already existing pension option. 8 Employment Stability Tips 5. Exiting the OPS PIL-Article 20.2 will only be granted where a ministry determines that operational requirements permit a member to exit from the workplace prior to the expiration of the six months notice. Members are entitled to: 1. Pay for the six months notice period (pro- rated). 2. Legislated Severance (Article 53/78) is one week for every year of continuous service up to 26 weeks. 3. Enhanced Severance (Appendix 9, Para 4) one week for every completed year of continuous service – no max. 9 Employment Stability Tips 5. Exiting the OPS-PIL-Article 20.2 (can be requested at any point during the 6 months, if no position offered) 4. Right to apply to restricted competitions for 24 months (Article 20.2.3) from date of original lay-off. If reemployed, Appendix 9 severance and balance of PIL must be paid back before the first day of re-employment (Article 53/78 repayment is optional). 5. Any member who takes PIL will forfeit all other redeployment rights including Factor 80 and tuition. 10 Employment Stability Tips 5. 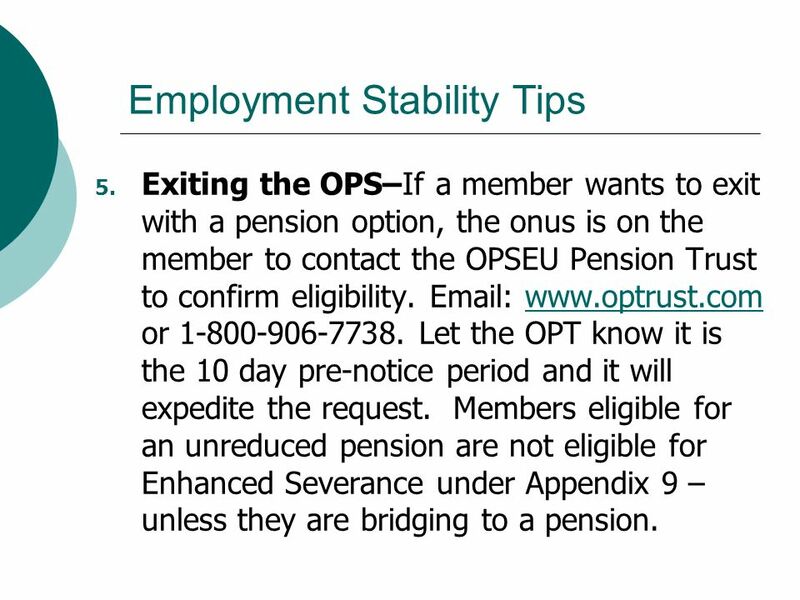 Exiting the OPS-Pension Bridging–Eligibility (Appendix 9) 1. Also applies to RPT and Flexible Part Time (FPT) employees who have received lay-off notice before Dec 31, 2012. 2. Member can bridge to a unreduced pension by using their 6 months notice period, Article 53/78 severance period and a further unpaid leave of up to two years. 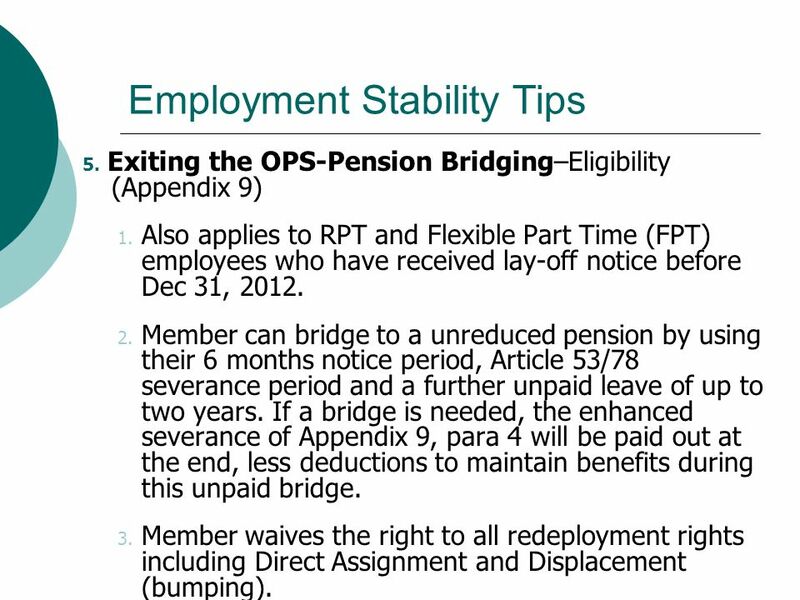 If a bridge is needed, the enhanced severance of Appendix 9, para 4 will be paid out at the end, less deductions to maintain benefits during this unpaid bridge. 3. Member waives the right to all redeployment rights including Direct Assignment and Displacement (bumping). 11 Employment Stability Tips 5. 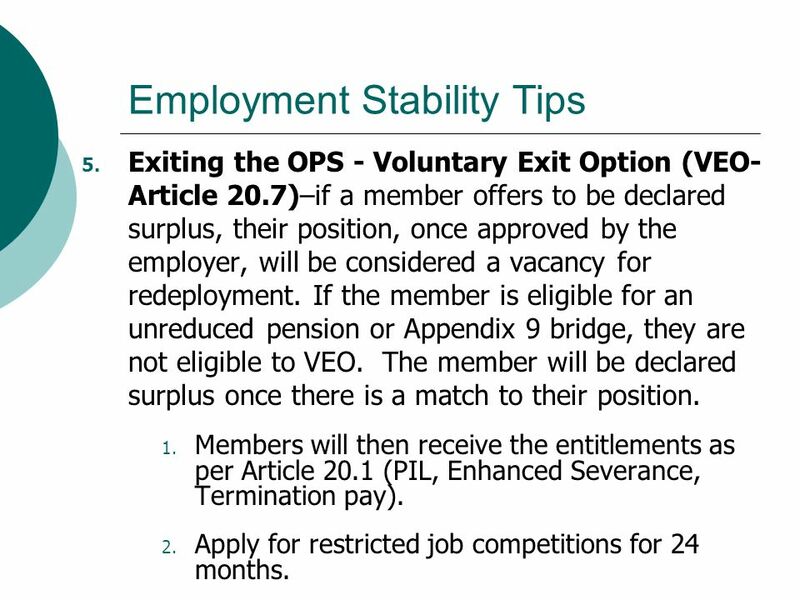 Exiting the OPS - Voluntary Exit Option (VEO- Article 20.7)–if a member offers to be declared surplus, their position, once approved by the employer, will be considered a vacancy for redeployment. 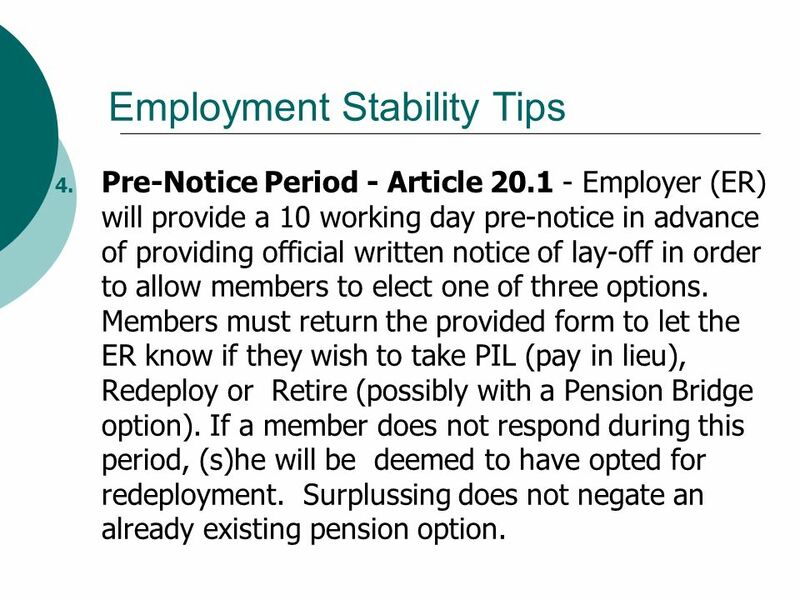 If the member is eligible for an unreduced pension or Appendix 9 bridge, they are not eligible to VEO. The member will be declared surplus once there is a match to their position. 1. Members will then receive the entitlements as per Article 20.1 (PIL, Enhanced Severance, Termination pay). 2. Apply for restricted job competitions for 24 months. 12 Employment Stability Tips 6. 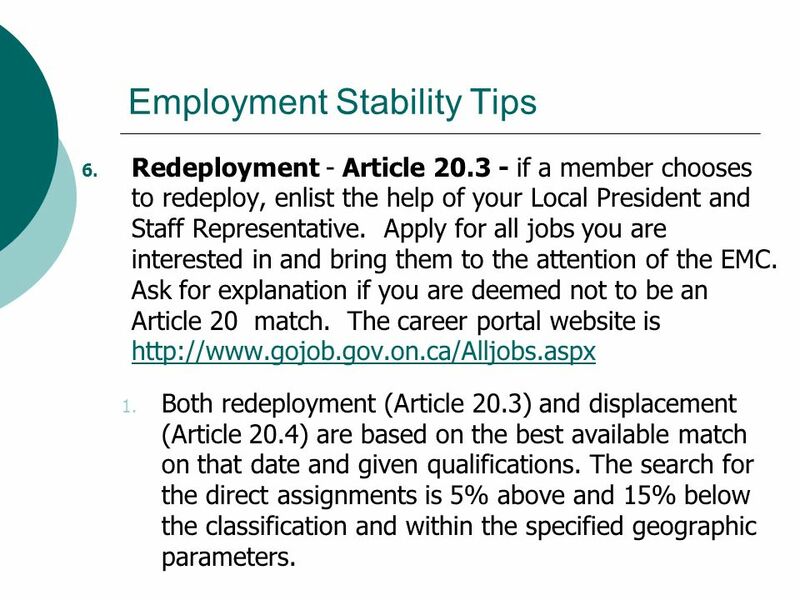 Redeployment - Article 20.3 - if a member chooses to redeploy, enlist the help of your Local President and Staff Representative. Apply for all jobs you are interested in and bring them to the attention of the EMC. Ask for explanation if you are deemed not to be an Article 20 match. The career portal website is http://www.gojob.gov.on.ca/Alljobs.aspx http://www.gojob.gov.on.ca/Alljobs.aspx 1. Both redeployment (Article 20.3) and displacement (Article 20.4) are based on the best available match on that date and given qualifications. The search for the direct assignments is 5% above and 15% below the classification and within the specified geographic parameters. 13 Article 20.3 Redeployment Contd 6. Redeployment-Article 20.3 Contd 2. Order of Consideration – based on continuous service date 1. Direct assignment into a VEO registered position within 40 km. 2. Direct assignment into a vacancy within 40 km. 3. Direct assignment into a position available through the VEO outside the 40 km, if requested. 4. Direct assignment into a vacancy outside the 40 km. 14 Employment Stability Tips 7. Displacement - Article 20.4 - occurs five (5) months after the receipt of the notice of lay-off. A member must be qualified, without training, to perform the work of the position identified. 1. A member has one week after the Displacement Notice Letter is received to indicate in writing their desire to displace. 2. The displacement can be refused without prejudice to accessing a factor 80 pension. 3. 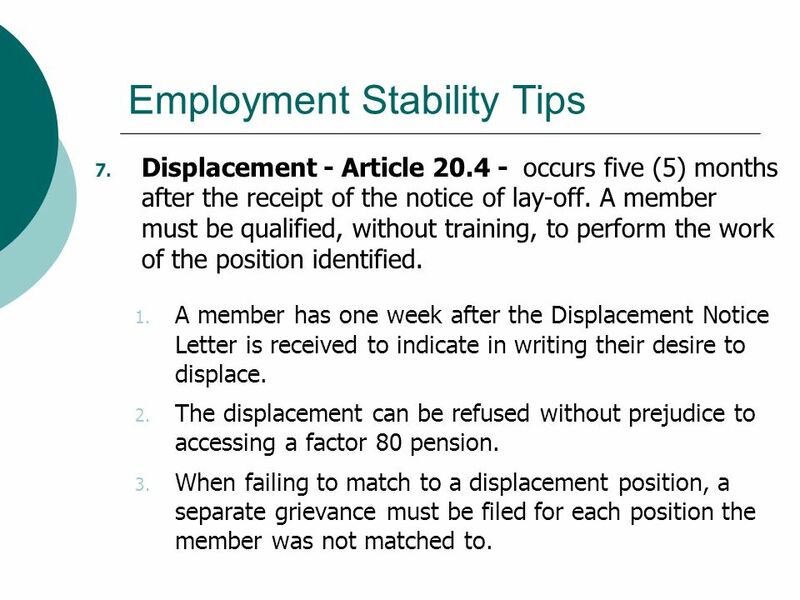 When failing to match to a displacement position, a separate grievance must be filed for each position the member was not matched to. 15 Employment Stability Tips 8. 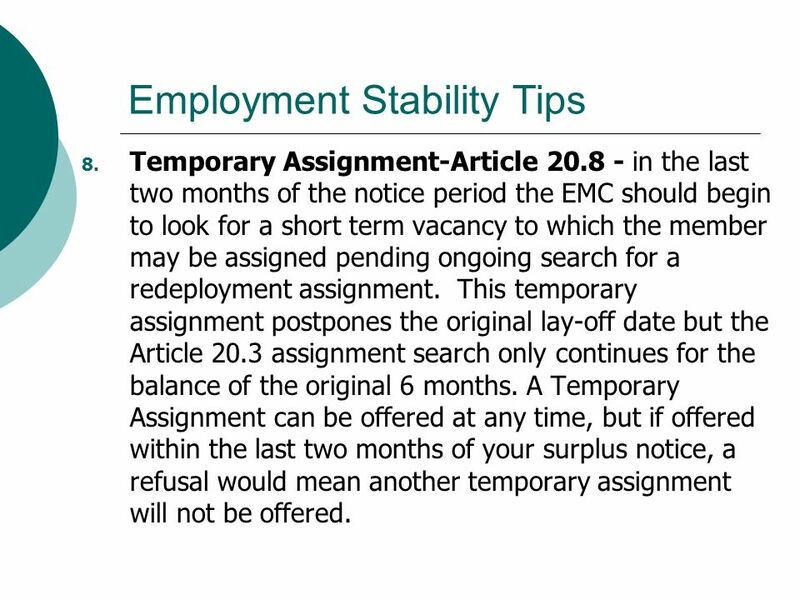 Temporary Assignment-Article 20.8 - in the last two months of the notice period the EMC should begin to look for a short term vacancy to which the member may be assigned pending ongoing search for a redeployment assignment. 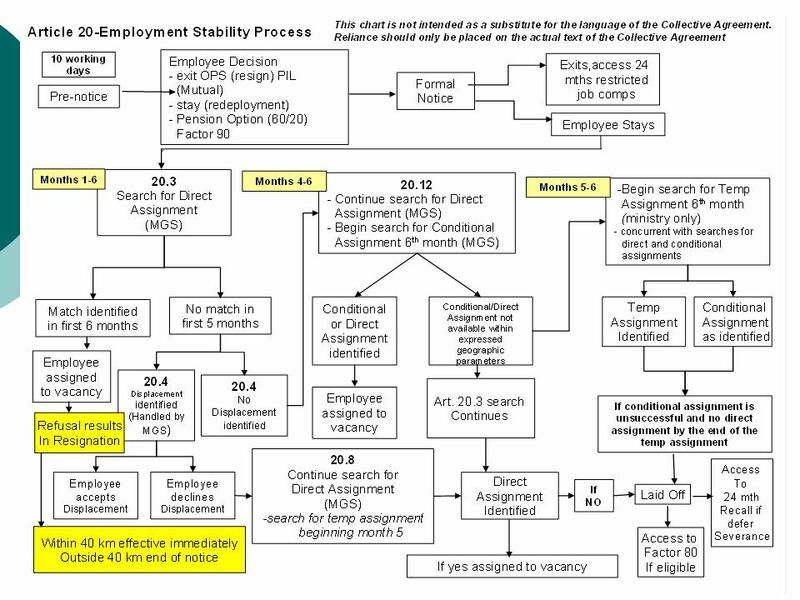 This temporary assignment postpones the original lay-off date but the Article 20.3 assignment search only continues for the balance of the original 6 months. A Temporary Assignment can be offered at any time, but if offered within the last two months of your surplus notice, a refusal would mean another temporary assignment will not be offered. 16 Employment Stability Tips 8. Temporary Assignment-Article 20.8 Contd To be eligible you; 1. Must be qualified to perform the required duties. 2. Must be in the same ministry and must be 5% above and 15% below your maximum weekly rate and be the most senior member. 3. 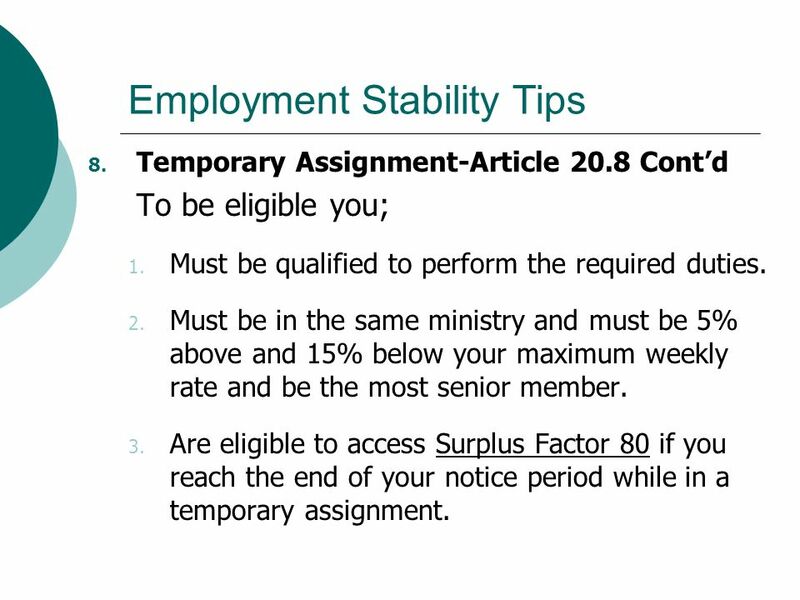 Are eligible to access Surplus Factor 80 if you reach the end of your notice period while in a temporary assignment. 17 Employment Stability Tips 9. Conditional Assignment-Article 20.12–in the last month of the notice period a surplus member can be assigned to vacant position where (s)he requires training to become qualified for that position. 1. It is expected that training will result in direct assignment to the position. 2. A Conditional Assignment vacancy is within the range of classifications whose maximum weekly rate is 5% above or 15% below the member own classification. 18 Surplus Factor 80 Factor 80 (Appendix 17) 1. Regular, Regular Part Time (RPT) and Flexible Part Time (FPT) can access Factor 80, once the employer has exhausted all Article 20.3 job matching possibilities and the member has not elected to have a displacement search beyond 40 km. The pension credit must totaly at least 80 years on or before December 31, 2012. 2. Members may bridge to Factor 80 so long as they obtain their Factor 80 date by December 31, 2012. 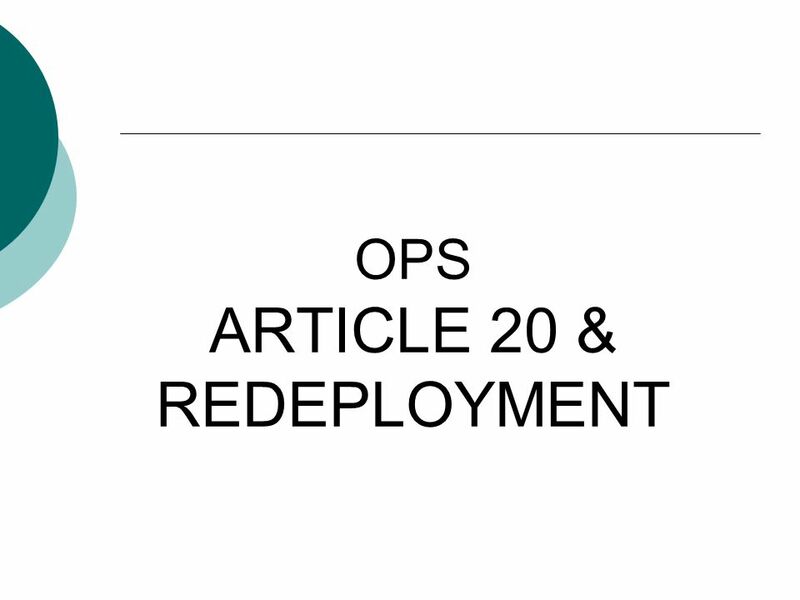 Download ppt "OPS ARTICLE 20 & REDEPLOYMENT. What is the purpose of this exercise? The purpose of this PowerPoint is to provide you with a quick reference that will." Teachers Pension Scheme – A Brief Guide October 2009. Local Government Pension Scheme November 2013 Auto-enrolment & the Local Government Pension Scheme Presented by Andy Cunningham. 1 SENIORITY The application of the criterion of length of service for the determination of –determination of benefits received (benefits seniority); and. A New Paradigm for the CIO Contract Presented By: Mary Dowell. 1 FORMULATING PRIORITY & SENIORITY LISTS Los Angeles Southwest College July 2008. 1 Winter 2014 Until We Meet Again. 2 Purpose of this Seminar Termination Benefits Pre Retirement Death Benefits Retirement Single Married Guarantee Periods. 1 A DMINISTRATION of E MPLOYEE N EEDS. 2 Lecture Outline  Differentiate between the different types of leave generally available in Australian companies. Change in Procedures Now going to give further clarification on how this impacts on the information you send to the pension section. Helping Your Employees Feel at Home in your Business Employer Assisted Housing. LESSON 12 LO4.3 Consider the legal and regulatory framework on employment cessation arrangements. Financial Policies Training: Payments to Individuals for Services (2.3.1) Effective Date: January 1, 2009. Office of Attorney General Maura Healey Earned Sick Time Law.